Inspired by the “Quiet One”! Yesterday was the birthday of a scrapping friend, Lisa, who always introduces herself as the ‘quiet one’ – I wonder why we always laugh at this! Lisa has bags of energy, fun, generosity, sassiness and yes can be a bit naughty at times so we love her to bits. Always full of great ideas and with Lisa any occasion is an excuse for a celebration. 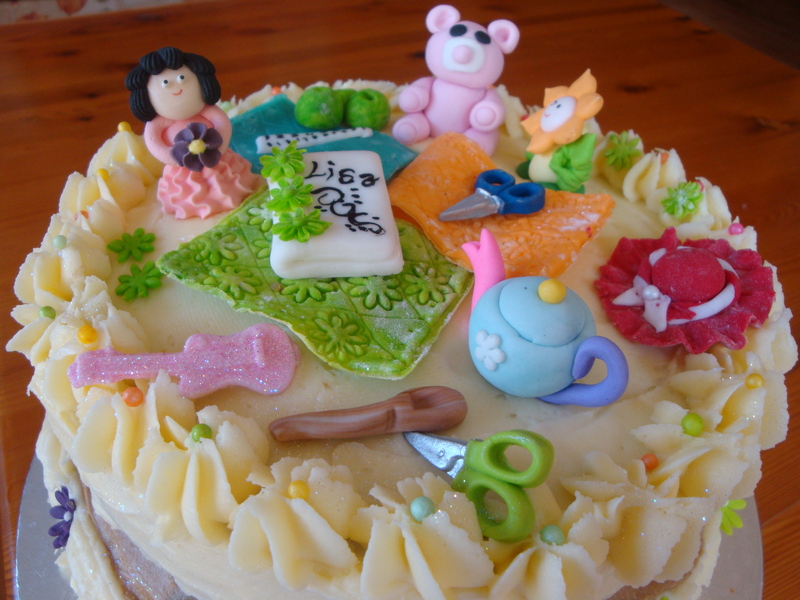 I hope you like your cake Lisa as I tried to portray a little bit of each talent that you have on one cake – not easy when you have so many. The icing in the middle is coffe flavoured to remind you of all the fun we have while scrapping and drinking coffee and yes it was meant to look like a matting of sorts to remind you how many photos you have matted in your lifetime. Thank you for all the laughs, little gifts and for just being YOU!